Scrabbling around for a starter to serve Friday week at the Garlic Festival lunch–and with three aubergines sitting looking at me expectantly, I got to flicking through some well-thumbed pages. The idea for rounds came from Antonio Carluccio’s Vegetables cook book. The key ingredients, doubling as casino counters! Cover an oven tray with foil and brush it with oil. 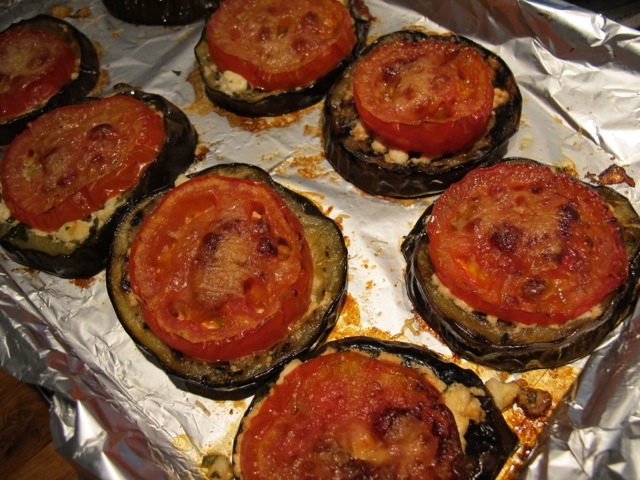 Brush both sides of the aubergine rounds with olive olive and lay them out on the foiled tray. Place the tray in the uppermost part of the oven and bake for 20 to 25 minutes until they are thoroughly cooked through and soft. 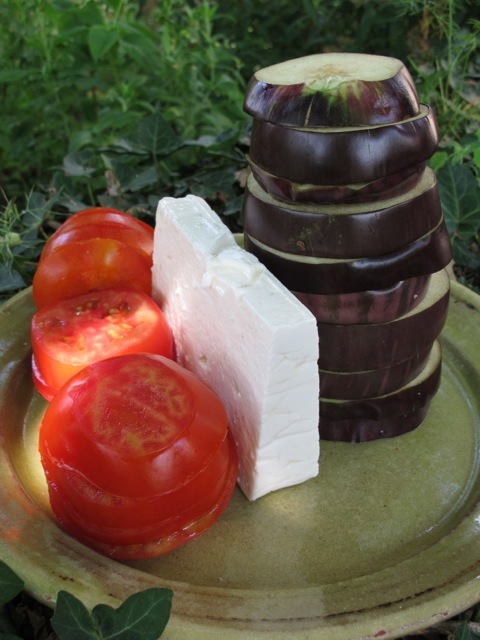 Add the chopped herbs to the feta and using a teaspoon, spread a little on each cooked aubergine round. Sprinkle the tomato slices with a pinch of salt and little olive oil. 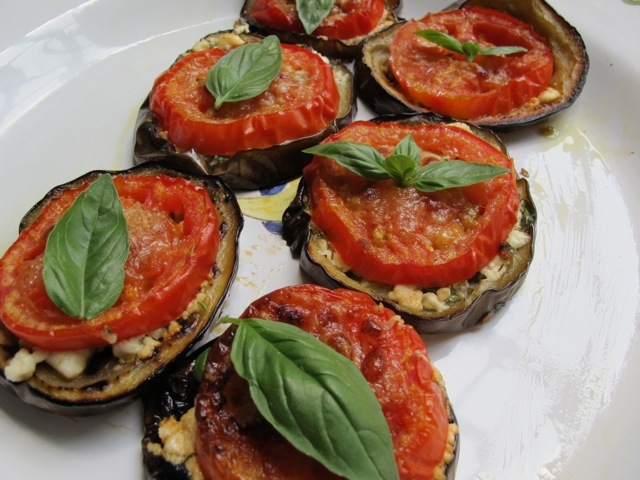 Lay one on each aubergine round and top them off with a pinch of the grated parmesan. Return the tray to the top of the oven and cook for a further 15 to 20 minutes. 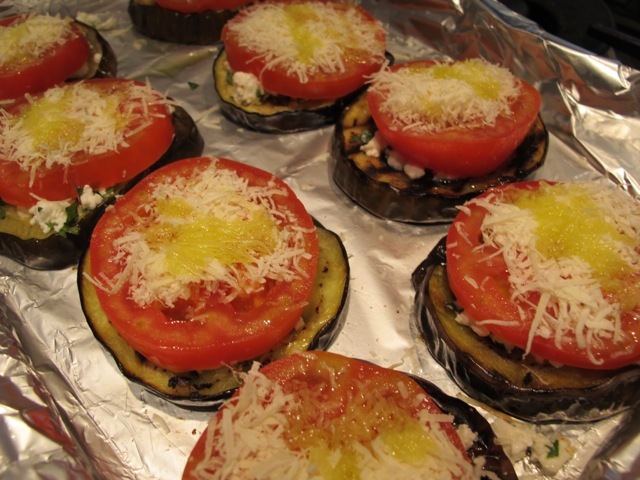 Take them out when the tomato has a melted look and the parmesan has browned a little. Serve them straight away or at room temperature. 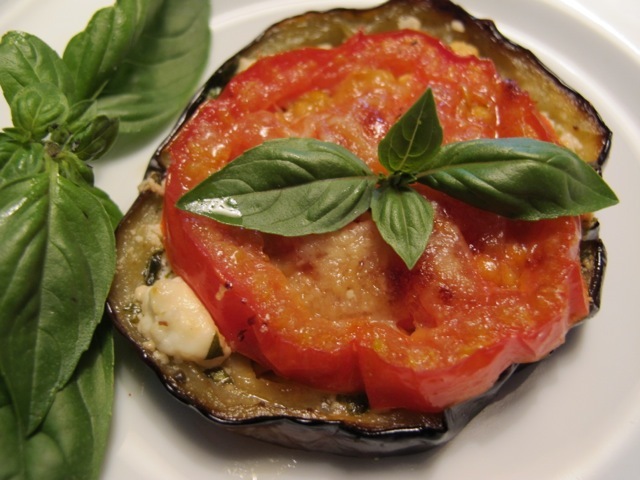 Increase the odds of a wow–with a leaf of basil or other herb–if you have any. Oh wow, these look marvelous! I’m growing aubergines, and my tomatoes are almost ready, too. We had your pork last night, it was so succulent and delicious. on July 24, 2013 at 5:29 pm | Reply Dianne P.
That looks good. Made me think of a Hugh Fearnely-W recipe I tried the other day – lot of trouble but good. Serves 3-4. Don’t try this for 22 – you’ll be at it all day! 500g courgettes, topped and tailed and sliced lengthways in 1mm slices on a mandolin. Discard first and last slice of peel. Salt and pepper the slices and add oil to coat. Heat griddle pan to v hot and, in batches, cook courgettes 2 mins each side until browned a bit. Lay slices in a dish. When pan has cooled a bit, add zest of a lemon and some juice, a sliced or squished garlic clove or two, a bit more oil, and swish round – doesn’t really need to cook as such. Tip over courgettes, sprinkle with feta (or mozzarella) and ripped basil (or mint). Serve luke warm. Bon appetit! And love to you both, Mark. Hi Mark!–working on grilled veg for lunch–just salted some courgettes! “Don’t try this for 22 – you’ll be at it all day!” good advice, I may rue the day (or night!) they do look good though. I am about to try Donald Douglass soup from the cookbook.You mention that his Captain McNeil chased you all over Cornwall.You were a little ambivalent about his soldiering skills.I was watching A Bridge too Far and this time he was on the run with Sean Connery thru a Dutch village……injured too….perhaps his comeuppance for the trials he put Ross and Demelza through! I love your cookbook and await the next!! Thanks Janet–Captain Maccers and I are reconciled and have settled for a bucolic amity in foreign parts!! The soup is delicious on a hot day–or any day.